"The experience of feeling disconnected from your body, or embodying ever-changing performances of gender, can be viscerally felt in the tension of looping animation." It's time you started following @erma.fiend on Instagram, if you don't already. 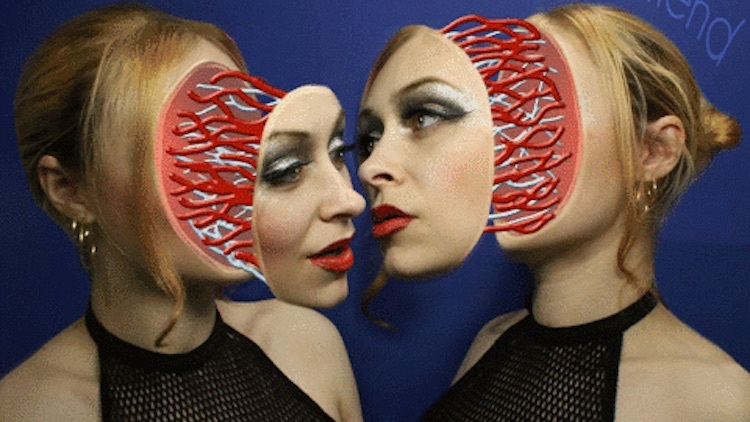 The incredibly well-spoken queer visual artist creates gory, expectation-defying, fluid looping GIF art that is easy to get lost staring at for hours at a time. They work both in front of and behind the camera, the subject of their own portraits, making Fiend a sort of animated disciple of Cindy Sherman with a bit more of an inclination for insect imagery. We've been following Fiend for quite some time, after seeing their work on the Bebe Huxley Scorpio EP, and so were delighted when we got to sit down with them to talk about their process and inspiration. Fiend has some enlightening insights on the fourth dimension, gender performance, the fluidity of the solid form, and making art that suprises the viewer. Read their thoughts in our exclusive interview below, and check out their GIFs in the attached gallery, where Fiend made an exclusive new piece just for us. OUT: First off, how'd you get into animation and gifs? What were your first experiments in the medium like? Fiend: I’ve been animating for a while, mostly motion graphics for production jobs or ambitious hand drawn shorts I’d start but never finish. It wasn’t until Giphy’s halloween gif contest last year that I got back into stop motion and photo collage, and it was very satisfying to be able to start and finish an animation in one night. I also love performing in drag and doing special effects so gifs were a way to combine it all. The great thing about learning animation is that you can study other people’s work by slowing it down frame by frame to see exactly how the illusion is created. I've learned a lot from watching traditional animation and I try to use the techniques of cartoon physics to create a surreal sense of logic in the physical world of stop motion. Pixilation (the term for stop motion with people) creates the effect of hyperreal cartoons. I ended up with this technique because I love the limitless nature of animated movement and fantastical physics, but I also love live action and the dramatic quality of human expression and physical materials. I'm always looking to use digital tools to enhance traditional animation techniques so I can keep that tactile quality of stylized real world elements. Walk me through the process of creating one of these - you make these by taking several photos in a row? Using After Effects? I shoot sequences of photos and then use Photoshop or Flash (Adobe Animate) to isolate different elements and then Frankenstein the frames back together on a timeline, usually with added effects drawn on top frame by frame. The preplanning involves sketches and frame charts, but once I start shooting it can take a new direction and lots of trial and error by the time it gets to the edit phase. I'll spend anywhere from a few hours to a few days on a gif, which are usually around 1 to 5 second loops. I shoot everything on my own, usually late at night in my apartment, so I use a wireless remote for when I'm in front of the camera. What draws you to creating the types of animations you make? You're clearly interested in gore/ horror—but what else inspires you? I’m definitely interested in surreal body horror as it relates to the illusion of solid forms of humanity that change over time, which I like to call the horror of the fourth dimension. Since we live in the third dimension, we perceive the fourth dimension as time (or, more accurately, as change happening over time). But in the fourth dimension, that changing thing is actually a constant shape, we just can’t see it that way. It’s the same logic of trying to draw something rotating in 3D on paper. If you made a little flip book of a cube spinning, to someone living inside the flip book a cube would mean two 2D squares morphing and intersecting themselves over time, even though we know a rotating cube is a contained and unchanging object in 3D. So to me the horror of the 4D comes from ideas like the object permanence of shapeshifters, or that objects deforming and scattering across time and space are actually very solid and contained in a higher dimension. Any kind of rift in our expectation of how things are meant to be fixed or unchanging starts to suggest forces that have a logic beyond our own comprehension. I’m endlessly fascinated by anthropomorphism and our perception of faces as unique from the way we perceive everything else - what makes up our visual sense of humanity, the semiotics of identity, in particular the aesthetics of performed femininity. When you are simultaneously behind and in front of the camera, you can explore the overlap of subject and object in a more nuanced way than with the pervasive male artist / female muse dynamic. I read you're hoping to expand into longer films down the line - can you talk more about upcoming projects? Right now I’m working on some stop motion segments for Richie Browntown’s new show Uncle No Rules, which has an amazing cast of characters. I'm also doing some animation explosions for a new kids show that I can't talk about yet except to say . . . there will be bugs. How do you feel your work is speaking to a queer audience, if at all? Animation is a great medium for capturing fluid identity that continuously oscillates between different states. The experience of feeling disconnected from your body, or embodying ever-changing performances of gender, can be viscerally felt in the tension of looping animation. The self remains whole as it morphs, deforms, and comes back together, creating a larger 4th dimensional shape from the rhythm it generates while moving through these different forms. The best advice I’ve heard from experienced animators is to animate verbs, not nouns. Animation isn’t about beautiful drawings or photos, it’s about the illusion of movement that’s created by cycling through these images. It’s a cathartic medium for depicting a sense of self that feels whole while destructing into scattered pieces at various stages of stasis. Loops can have different trajectories; some are closed looping cycles, while others are linear - a form enters, morphs into something else, and leaves the shot. In this second case I like to play with the idea of the dynamics of attraction, what roles we occupy and how the self changes in relationship to the other. One of my favorite kinds of loops are the ones where the first form interacts with itself at a later stage - for example, the one where I push myself down the stairs. I think that’s something that probably resonates with other queer people - playing defined roles at different times in a dynamic and having your sense of self shift as you move through these different roles with someone else. I like to create work where tension and discomfort feels meditative and destruction becomes a passing state of cyclical change. Perceptions of gender and femininity are at the core of real world power structures, and the more we see that perception distort the harder it is to think of those structures as natural or inevitable. White bodies aren’t inherently subject to being politicized, but being read as femme both in front of and behind the camera inevitably frames my work, especially in the field of horror effects / dark comedy animation which more often than not uses feminine forms as flattened sexualized objects removed of nuance and agency. What other artists/ animators should we know about? I love animators with a perverse sense of humor and great color palettes. Inspired regularly by animators/multimedia performers like Jamie Wolfe, Dax Norman, RAFiA Santana, Julian Glander, Sholim, PIXELtheartist, Phyllis Ma, Jaimie Warren, Sarah Squirm. What's your favorite claymation movie? Anything by Jan Švankmajer, Gumby, Prometheus and Bob from the late 90s Nickelodeon show KaBLaM! Not claymation specifically but Stephen Sayadian’s Dr. Caligari (1989) and Vince Collins’s Malice in Wonderland (1982) are favorites for animation and special effects. How did you come into contact with Bebe Huxley to design for her? Bebe and I first started talking on Instagram. As a drag jester myself I’m always on the lookout for other gender performers who play with femme masculinity. She was in town for pride this spring so we had the chance to collaborate on a shoot. It was definitely one of the most ambitious gifs I’ve done, which was a real treat to shoot with a subject who was not myself because I’m used to posing on camera while simultaneously trying to glance at the preview monitor. I love Bebe’s energy and aesthetic, and her Scorpio album was a perfect match for my obsession with human bug illusions.